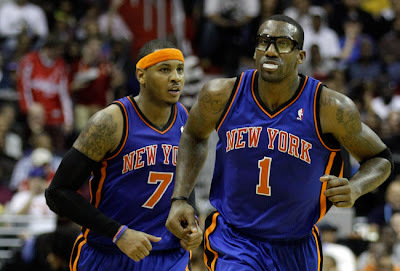 The New York Knicks gave center Tyson Chandler, the key to their improved defense, a day off against the Atlanta Hawks. Both teams seemed to scrap their defenses through three quarters of a shootout between playoff-bound teams. However, it was a defensive play that decided the game when Amare Stoudemire blocked Marvin Williams' dunk attempt at the buzzer to save the Knicks' 113-112 win over the Hawks on Sunday. Carmelo Anthony scored 39 points and hit the winning jumper with 1:40 left on Atlanta's defensive miscommunication. Stoudemire finished with 22 points and 12 rebounds in his second game back after missing 13 with a sore back. Williams scored a season-high 29 points in a rare start, but came up empty when he and a full-throated crowd in Philips Arena felt he was fouled. Defense was often absent as the Hawks shot a season-high 15 for 23 on 3-pointers, and the Knicks were 12 for 19 from beyond the arc. New York led 94-93 after three quarters. The Hawks (38-26) hold the No. 5 seed in the East, and still have hopes of securing homecourt advantage in a likely first-round match-up against the Celtics (37-27). Sunday didn't help, and Atlanta All-Star Joe Johnsonwasn't happy about it after he spent much of the day chasing Anthony. Johnson scored 22 points on 9-for-14 shooting. Anthony was 14 for 32 as the only New York starter to shoot under 50 percent.